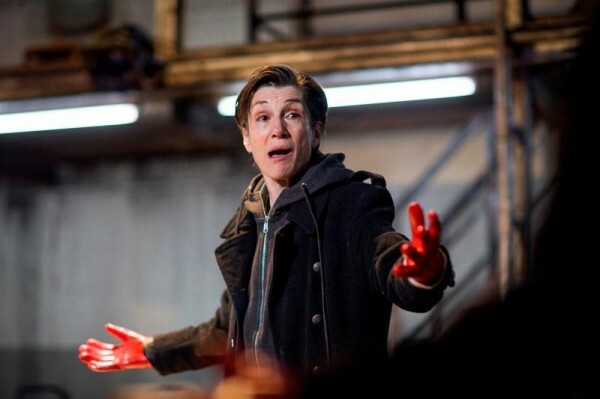 Phyllida Lloyd's all-female production of Julius Caesar for the Donmar Warehouse transplants Shakespeare's play to a women's prison. William Drew discusses the prison setting as metaphor with Assistant Director Hannah Price. The company is still in rude health today, recently winning awards and critical acclaim for Lucy Kirkwood’s It Felt Empty When the Heart Went at First But It is Alright Now. Alongside productions, they do pioneering education work including a theatre training programme for women who have been affected by the criminal justice system in some way. Two graduates of that programme, Carrie Rock and Jen Joseph, are appearing in Phyllida Lloyd’s production of Julius Caesar currently running at the Donmar Warehouse. Though this isn’t a Clean Break project, it feels as if it wouldn’t have come about without that company’s existence. The cast, director, designer and assistant director are all female. Chloe Moss, who has written several plays for Clean Break, is the Creative Consultant. The play is set in a women’s prison. It’s certainly not the first time that Shakespeare’s play has been associated with prisons. The Robben Island Bible (the Complete Works of Shakespeare that was passed around the inmates of the notorious prison in apartheid South Africa) is currently on display at the British Museum with a passage highlighted by Nelson Mandela. Two films: Caesar Must Die and String Caesar have been doing the rounds of the international film festivals this year. The first follows a group of male prisoners as they rehearse a production of the play, while the second focuses on Caesar’s earlier life and uses a mixed cast of prisoners and professional actors (all male also). The metaphor of the prison has its basis in the original accounts of Caesar’s rule, Price points out. “If you look at the historical context, if you read sources from that time like Cicero, there’s lots of stuff about how the conspirators must have felt like they were in the prison: the erosion of powers, etc.” By setting the play in a prison, Lloyd makes that gives that metaphor into the world of the the performance. The conceit has been highly developed. Anouka says “I know who my character is, the prisoner. I know what she did to end up in prison and how long her sentence is. We all know those things about our characters. We all know their names. Sometimes we call each other by our prisoner names.” Two fictional worlds co-existing on stage together then. As the production jolts into being, we, the audience, instantly feel that we are part of a very specific private world. Caesar (played by Frances Barber) leads the rest of the cast in a militaristic aerobics routine while they wear paper masks with her face on them. They do not speak Shakespeare’s lines to start with so they are established as having non-Shakespearean identities. Price tells me that everyone knows the reasons that they have been cast as whoever they have been cast as in Julius Caesar, how that makes sense in the world of the prison. The coexistence of these two worlds is a complex one but one that pays dividends throughout the play. One of the most shocking moments comes when the performance is interrupted by Alice Bell as the Prison Guard who removes Rock so that she can take her “meds”. Helen Cripps is told to read in for Rock’s character and picks up a copy of the play in order to play Cinna the Poet. She is then “beaten up” by the angry mob. The prisoners actually hurt her, perhaps expressing some pent up hostility they have towards their fellow inmate for reasons we will never know, and she shouts at them to stop. The levels of representation at this point in the production are staggering (Cripps playing a prisoner who stands in for another prisoner in playing Cinna the Poet who the crowd beat up because they think he is Cinna the Conspirator). The multiple levels mean that we accept the Shakespeare as a fiction but often respond to the prison world as “real” so that when Cripps is “hurt”, we forget for a second that she, the performer, hasn’t actually been injured. It’s far from a dry intellectual conceit though. When you watch it, it feels dangerous and visceral. It is only afterwards that you start to contemplate what was going on underneath. The all-female casting also draws attention to the conceptions of male and female qualities in Shakespeare’s play and calls these into question. Women are presented as weak and they are denied knowledge throughout the play: both their own knowledge (Calpurnia’s dream of Caesar’s death) and the knowledge of others (Brutus’s initial refusal to tell Portia what he is planning). The all-female casting makes it very clear that these are all processes of power in play. Portia and Calpurnia do not have power within the world of Shakespeare’s play but the single-gender casting highlights the performative, constructed nature of this hierarchy but, by the juxtaposition with the prison world, it admits the impossibility of escaping hierarchy altogether: the hierarchy of the prison world is clearly an intricate one even though we are never told explicitly what it is. The play is reduced to two hours and performed with absolute conviction by the cast. It is a testament to Lloyd’s direction that there’s a cohesion to the ensemble despite the wildly different levels of experience and specialisations among them (some are principally musicians or physical performers). There’s a sense that they have to see the narrative through to the end and nothing is going to stop them. Walter’s performance is extraordinary to behold but it is not showy. There’s a reluctance and reserve to her brilliance that is both admirable and entirely appropriate to her character. Cassius knows what Brutus is capable of and knows that they can only overthrow Caesar if Brutus leads them in the enterprise. There’s also something quietly unhinged about Walter. She is the last to leave the stage after the prisoners are all called back to their cells at the end of the play. She presses herself against the wall in the corner of the stage, as if she is lost in the fiction, unable to return to “real life”. The role of the audience is potentially the most problematic element of the conceit. The interruptions, something that came out of Lloyd’s research into prison life, pierce through the world of Shakespeare’s play and bring us straight back to the world of the prison. At one point though, a cast member turns to the audience, apparently in character as a prisoner and says, “You may as well all just go home”. The implication seems to be these women are not putting on the play for themselves, as I had assumed up to that point, but for us, the audience. In which case, who are we? The standard answer for a production of this play is that we are the people of Rome but this means that we only exist in Shakespeare’s world and not in the prison world. It’s possible that we are an imagined audience in the collective minds’ of these prisoners. They want to do a good job for themselves and how they imagine others perceiving them. This is a slightly woolly conceit though and the framework does seem to unravel a little here, which is perhaps inevitable in a production that is juggling this many levels of reality/representation at the same time. These minor concerns aside, this is a production that manages to combine provocative meta-theatrics with stunning narrative and linguistic clarity and gives the opportunity for some brilliant actors to explore political and emotional ranges that they might not frequently get access to. It doesn’t present a particularly nuanced view of Caesar’s leadership, a criticism that was also levelled at Gregory Doran’s recent RSC production, but why should a production of a classic play always have to be balanced? If this is your first experience of the play, the chances are you’re going to want to see it again so you’ll have plenty of opportunity to explore its possibilities. Barber plays Caesar like a petulant toddler and Walter’s dignity and poise means that it’s hard not to feel sympathy for the conspirators. This is what makes Cush Jumbo’s delivery of Mark Anthony’s great speech of political reversal all the more of an extraordinary feat. Starting from a prostrate position on the floor with guns pointed at her, she gradually uses the power of language to raise herself up and by the time she has finished, the guns are pointed not her but at the conspirators. We are swept along by her rhetoric of Anthony’s righteousness despite knowing how odious Caesar was. Even without the rich conceptual framework, Walter and Jumbo’s performances at two sides of the political struggle in what is arguably the greatest political play ever written would make this production something that shouldn’t be missed. Julius Caesar is at the Donmar Warehouse until 9th February 2013. For tickets visit the Donmar’s website.